How did Vatican I change the church? The interpretation of the Second Vatican Council has been a matter of controversy since the council ended. Should the council be interpreted in continuity with the church’s traditional teaching (especially from Trent and the First Vatican Council), or does it represent a significant new departure for the church? This is an important question, to be sure, about which there has been much discussion of late. But so, too, is the question of whether Vatican I represented a departure from the church’s history and practice, and this is an issue which has not received as much historical attention. In other words, in what sense was the Roman Catholic Church, and the papacy in particular, the same institution before and after Vatican I? Prescinding from the theological conviction that the continuity of the church over time is guaranteed by the indwelling of the Holy Spirit, I would argue that the church in the 19th century—and the papacy in particular—was a radically different institution in the century after the French Revolution, so different as to raise the historical question of whether the church underwent a revolution of its own. In the course of the French Revolution, the papacy came as close to becoming extinct as it ever had in its long history. There was real doubt whether there would be a conclave to elect a new pope after the death of Pius VI, who had been deposed and was a prisoner of the French revolutionary armies. Rome was occupied by French revolutionary troops, and the number of cardinals was at a historic low. And, of course, the agenda of the most radical phase of the revolution had been to eliminate Christianity itself, replacing it with the Cult of Reason. There were even many Catholics at this time, including bishops and priests, who were resigned to the possible disappearance of the papacy, wondering whether it had outlived its usefulness. It was only Napoleon’s conclusion that the papacy could be of use to him in reconciling Catholics to his regime and gaining control of the church in France that led him to recognize the election of Pius VII, who was effectively his puppet and later his prisoner. Recall the stunning image in Jacques Louis David’s painting of Napoleon’s coronation in the Cathedral of Notre Dame where the pope sat by as a useless spectator. Arguably, the church received the most profound shock and injury, nearly fatal, in its entire history during the revolution, and it is not too much to say that during the church’s “long 19th century,” to borrow a phrase from John W. O’Malley S.J., which lasted into the 1950s, the church was suffering and manifesting the symptoms of something akin to an institutional version of post-traumatic stress disorder after such a near-death experience. 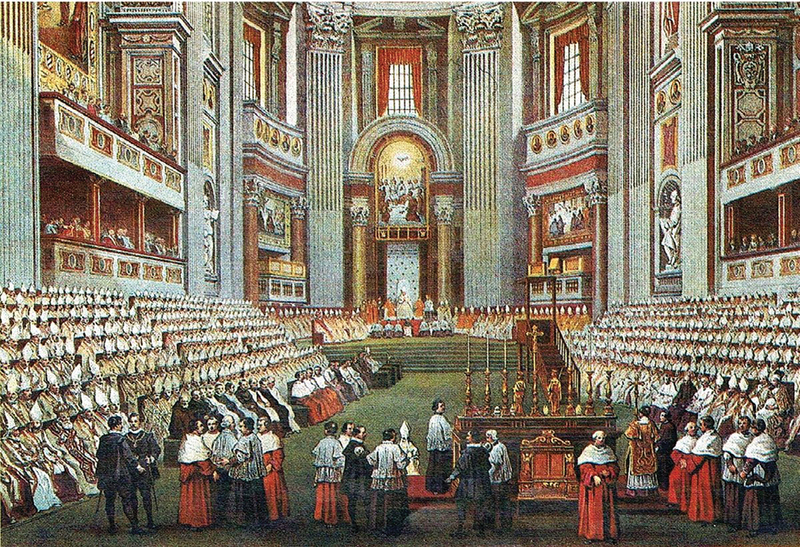 The radical restructuring and reorientation of the church during the course of the 19th century toward the center, around the papacy, often termed Ultramontanism (ultramontanus means “beyond the mountains” i.e., to Rome), was, arguably, the greatest structural revolution in the church’s history and raises the historical question of the extent to which the church, and the papacy in particular, were the same institutions before and after the French Revolution. The threat to the Catholic Church and the papacy through the 19th century was real, and the church’s reaction to that threat was understandable. Indeed, the church remained threatened on all sides. On the left, secular liberals sought to reduce or eliminate the role of the church in public life and civil society (by suppressing church schools, for example, and expelling religious congregations). The more radical heirs of the revolution and the socialists and communists into whom they evolved remained committed to the church’s utter destruction. But the threat was also from the nationalist right. Otto von Bismarck’s Kulturkampf was aimed directly at the Catholic Church, imposing state supervision of Catholic schools and seminaries and government appointment of bishops with no reference to Rome. The agenda of the Italian Risorgimento was predicated upon the destruction of the temporal power of the papacy, that is, the pope’s governance of the Papal States, upon which the political independence of the papacy and its position as an international actor were presumed to rest. Even the church’s supposed allies among the Catholic monarchies of Europe sought to control and domesticate it, as they had done in the previous century. Pius IX’s “Syllabus of Errors,” so often held up to ridicule as an absurd statement of the church’s stand against the modern world and progress, is certainly comprehensible against the reality of these threats from modernity. The definition of papal infallibility at Vatican I did not represent the most radical act of the council, even though that definition resolved controversies over this issue at the extreme, with the pope infallible apart from and above a council. But papal infallibility has to do with doctrine and, as we know, has been invoked only once in the history of the church since Vatican I, when Pope Pius XII defined the Assumption of the Blessed Virgin Mary in 1950. Rather, it was the establishment of the juridical position of the pope in “Pastor Aeternus” as “ordinary and immediate” pastor of the universal church that worked a revolution in the governance and structure of the church and represented a significant departure from earlier practice. While previously the pope had needed to work with local churches and rulers in the appointment of bishops—often as the last stop in a process when the appointment was essentially a fait accompli by the time it reached him—now the pope would, for the most part and increasingly, appoint bishops directly (and he could dismiss them, too). And while the definition gave significant new juridical powers to the papacy, the veneration of the pope—in his person as well as in his office—grew up initially around Pius IX, the prisoner of the Vatican, and around every pope subsequently until it reached its apotheosis in the rock star status of St. John Paul II. This exaltation of the pope gave individual popes a moral and spiritual authority and a personal popularity and recognition unlike anything that had been seen before. The concentration of teaching authority in the hands of the pope and the centralization of administration in the Roman Curia in his name were intelligible against the background of the mortal threats the church had faced in the revolutionary era and still believed itself to face throughout the long 19th century. Centralization would facilitate quick and decisive decision making. Concentrating juridical power in the hands of the pope as ordinary and immediate pastor meant that he could impose discipline directly on bishops throughout the world and assured that the church would speak with one voice and act with unity in the face of threats. Even democrats like Cardinal Henry Edward Manning in Great Britain thought unity and discipline within the church were of the utmost importance in protecting the church and advancing its interests in a liberal, democratic state, and so he was one of the strongest advocates of the ultramontane position. Moreover, modern means of communication and the church’s ability to use those means to organize mass movements among the faithful (like devotion to the Miraculous Medal, Lourdes and Fatima) helped to spread a more unified and uniform Catholic culture. This drive to unity and uniformity influenced and revolutionized almost every aspect of the church’s life. In the first instance, it transformed the practice of the church’s magisterium from a more diffuse and decentralized consultative process involving the universities and national churches as well as the papacy, which was thought to have a final, adjudicatory authority at the end of a process of discernment, to one in which the papacy became the initiator and definer of orthodox teaching, which it then imposed from above and frequently: witness the flood of papal encyclicals from Leo XIII onwards. The efforts to eliminate theological diversity in the anti-Modernist period were a further expression of this tendency, but it continued well into the last century and arguably still exists today. Discipline in the church was extended, in new and significant ways, over national churches, religious orders, intellectual life and seminary training, and over the political and social engagement of the faithful in the name of Catholic Action—political movements in various countries directed by the hierarchy. All were enhanced by a dramatic expansion in the reach, authority and personnel of the Vatican congregations. Historians speak of the “devotional revolution” effected in the course of the 19th century, in which the more diverse and idiosyncratic devotional life of local churches—local shrines, saints and customs—was gradually displaced by the panoply of Roman devotions that Roman-trained bishops and priests brought home with them and imposed as normative practice: novenas, exposition of the Blessed Sacrament, Stations of the Cross, holy hours and the cult of saints particularly favored by the papacy, like Thérèse of Lisieux and the Curé of Ars. The ultramontane revolution transformed the church, then, from top to bottom, from a decentralized, diverse grouping of local churches in loose communion with the pope to a highly centralized, uniform, much more monolithic organization than it had ever been. In this sense, the church mirrored and imitated the great empires and national states of the 19th century, which used new means of communication and transportation to consolidate power, enforce unity and build bureaucracies. It did so, once again, out of a great sense of urgency, driven initially by the conviction that its very survival and existence were at stake. In one of the great ironies of history, the outcome of the church’s near-death experience at the beginning of the century was the emergence of an organization at the end of the century that was incomparably stronger, more united (and more monolithic), with a more triumphalist sense of its own institutional identity than it had ever possessed. Moreover, to add to the irony, church leaders managed to convince others, and even themselves, that the institution they had created was the church as it had always been from time immemorial. But what they had created was a far more decisive departure from what had gone before than what has been claimed for Vatican II by the most radical proponents of historical discontinuity. Is there a followup article by Fr. Arx moving forward to an analysis of Vatican II and the pontificate of Pope Francis? The centralization changes because of the French Revolution. that is so well articulated in this article finally resulted in giving the Church strength in the 1950s. As an oldster I remember that the most admired and sucessful corporate entities in 1955 was GM,IBM and the Catholic church... All three are and in need of renewal The clock turns and renewal is always necessary.so I'm open to the de-centralization as we see in Pope Francis's initiatives. . He went to Princeton, is President of Fairfield University. Thanks for writing this Fr. von Arx. I found this article very enlightening. It meshes with what I learned in high school and university, but puts all the pieces together in a wonderfully intelligible way that I didn't before seize in my disparate studies, including years spent in France studying history, philosophy and theology. I don't agree with W. Rydberg's critique. His points are interesting, but lack focus, almost as it he's answering questions not asked. It's as if he read a different article all together. While agreeing that the increased speed of communication made it possible for the Papacy to keep closer tabs on what was going on in the Universal Church - I would say the changes in the Church over the "Long Century" were less systematic/absolute/upsetting to your average Catholic than the changes of Vatican II. If you looked at a typical Catholic Church/Liturgy in 1760 and again 1960 what differences would you notice ? If you looked at a typical Catholic Church/Liturgy in 1960 and then again in 1970 what changes would you not notice ? Sadly the Churches that were filled in my childhood are largely empty. Why is that ? Did the Liturgical Absolutists who so massively the Liturgy/Churches since Vatican II, even though there was no outcry from the Faithful for such changes, help or hurt the faith ? To be honest, the only thing that I ever associate with Vatican I is the doctrine of papal infallibility - arguably the biggest mistake the church has ever made. IMHO, whatever harm done to the church by Vatican I is only redeemed by Vatican II whose greatest achievement is arguably the definition of the church as the "People of God." Regardless of the 19th century political considerations or the papacy's near-death experiences that shaped the church in the modern age, the Second Vatican Council ranks as the second greatest council in the two millennia history of the People of God since the crucifixion and the rise of the resurrection mythologies, ranking just after the First Council of Jerusalem which proclaimed that the kerygma was for all, Jew and/or Gentile alike. Fr. Jeffery's comments provide me with a valuable synthesis of understanding of many aspects of the organizational church in modern times. These are concepts and ideas that I have grappled with for over fifty years, at least since studying history as an undergrad. There were important disconnects between political and church history that are clarified by these insights. For me it a bit like a jigsaw puzzle whose pieces are now assembled and make the picture of the puzzle much clearer. Thank you. The centralization of authority in the appointment of bishops has not been an unalloyed "good" for the US church. Take a fellow from Boston and put him in Cleveland, or the guy from Peoria moved to Newark...and now we have one man running two dioceses separated by 1,200 miles. The Church's "Long 19th Century" is a textbook case of willful mismanagement. "There were even many Catholics at this time, including bishops and priests, who were resigned to the possible disappearance of the papacy, wondering whether it had outlived its usefulness." Well who were those Catholics, bishops and priests? What do you mean by "the papacy"? The papal states? They believed there would not longer be a bishop of Rome? I doubt that. Catholic doctrine guarantees the office of Peter while not guaranteeing the form the papacy might take which is a point St. John Paul II raised in Ut Unum Sint. There are dangers with the current emphases on local churches: the loss of the notion of a transcendent Catholic unity not the sum of the local churches, national churches, which by the way was also part of the 19th century in gallicanism, febronianism, the Kulturkampf. The 19th century wasn't simply a monolithic papal power grab supported by the ultramontanists. Near-death experience? Hardly. Arianism was worse. The Protestant revolt was worse. The temptation to this type of thinking is answered by the non-Catholic Macaulay: "No other institution is left standing which carries the mind back to the times when the smoke of sacrifice rose from the Pantheon, and when camelopards and tigers bounded in the Flavian amphitheatre. The proudest royal houses are but of yesterday, when compared with the line of the Supreme Pontiffs....But the republic of Venice was modern when compared with the Papacy; and the republic of Venice is gone, and the Papacy remains. The Papacy remains, not in decay, not a mere antique, but full of life and youthful vigour....She saw the commencement of all the governments and of all the ecclesiastical establishments that now exist in the world; and we feel no assurance that she is not destined to see the end of them all. She was great and respected before the Saxon had set foot on Britain, before the Frank had passed the Rhine, when Grecian eloquence still flourished at Antioch, when idols were still worshipped in the temple of Mecca. And she may still exist in undiminished vigour when some traveller from New Zealand shall, in the midst of a vast solitude, take his stand on a broken arch of London Bridge to sketch the ruins of St. Paul's." Trauma yes, from the beginning , ever was and ever will be! In external forms at times sickly, and apparently “near death?” Yes, but deep within where the Spirit dwells the Church’s vitals strong and surging! He did say “I am with you all days …” not “some days!” For the Body of Christ, the Church, whom we are, no requiems, no dirges, always the heavenly music of the Stone rolling back, rocking the cosmos – always the “smell” of Easter. As poster Fr. Villa says, the Church is “not a mere antique” and as another poster Mr. Stuart Bintner says the “jigsaw puzzle” the Church, now much clearer. I love history and so I loved reading Fr. Von Arx’s Church history lesson, very informative about the Church, which if I may, remains as always a challenging “crossword puzzle” with the accent on the CROSS of Jesus and the WORD of God. As someone has pointed out where there is light, there are also shadows. Let’s follow the light! This article also appeared in print, under the headline "A Post-Traumatic Church," in the June 22-29, 2015 issue. Jeffrey von Arx, S.J., president of Fairfield University, is a professor of history.